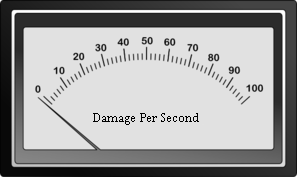 DPS (average rate of damage inflicted over time) is a critical component to many gamers, being a measure of how much they contribute to combat. Many factors contribute to DPS. Combat is chaotic and complex, and in D&D, the character creation rules are even more complex. At times it can be very difficult to determine the optimal choice. The best way to set a monster’s CR is to see how it handles in play. This can be time-consuming, but it probably gives you the best information about how challenging your monster is. A typical monster has a lifespan of five rounds. That means it basically does five things, ever, period, the end. Create a "playtest party" consisting of four characters whose level equals your monster’s target CR + 2. Each character should be built using the standard ability score array and equipment for a PC of their level. Include a fighter, rogue, cleric, and wizard if possible. That is actually a lot of work, especially at higher levels. In theory, I can use Tables 4-12 through 4-22 from the DMG (3.5, p112-p126) to make this easier. (Sorry, was not able to find the d20 versions of these tables. If you know where one is, let me know and I will link it here). concentration will be version 3.5. Perhaps the simplest part of the combat calculation is weapon damage, until you factor critical hits. In Dungeons & Dragons (1974) book 1, all attacks which score hits do 1-6 points damage. Include a fighter, rogue, cleric, and wizard if possible. It will be much easier to start off with a party of 4 fighters, and with some luck, maybe we can go back and revisit that decision. Splint mail, heavy steel shield, masterwork melee, mundane ranged, 350 gp. We will assume they hit at the same time, they handle critical hits like dnd3.5, doing d6 damage.